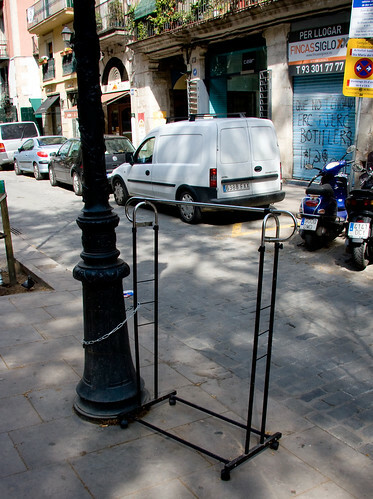 During my stay in Barcelona recently I walked past this clothing rack securely locked to a lamppost. My friend Txell told me the story. Locking your bicycle to benches, lampposts, railings, etc is not allowed in Barcelona. One chap who had his bicycle lock cut and his ride removed by the city couldn't be bothered to pay the €60 fee to get his bicycle back. Instead, he invested the money in a whole bunch of locks and promptly proceeded to lock all manner of objects to lampposts and railings all around town. This clothing rack is one of the lesser impressive objects. Txell has seen a sofa locked up and a microwave oven, too. This humble protest action has become street art installation and it still continues. Brilliant.